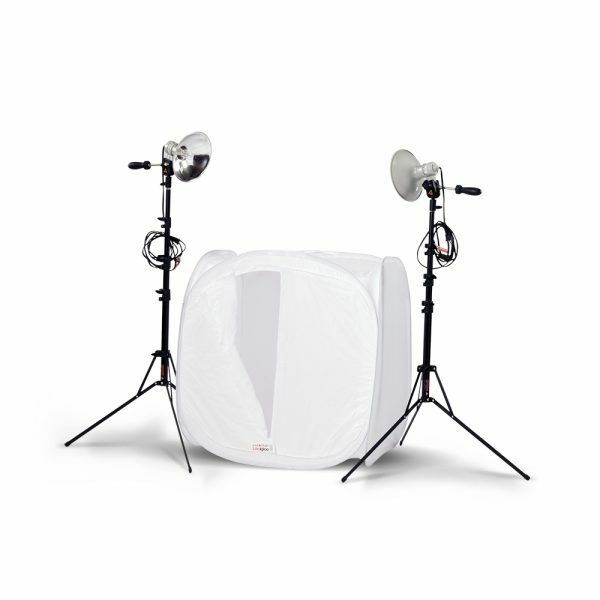 The FirstStudio® Product Kit utilizes our medium pop-open Igloo and includes two FirstStar 250 watt tungsten lights to evenly illuminate the Igloo. Just place the lights a few feet away on each side of the Igloo to create soft, shadow less light inside the Igloo. Then use one of the two included Velcro® attached background sweeps as a set to place your product or collectible inside the Igloo. The Velcro flaps on the side of the Igloo can be pulled away to facilitate easy placement of your product, then they can be sealed around your lens if necessary for complete tenting of your scene to block unwanted reflections.